Undo a lock or latch, swing open the numbered door, and count on finding fun when the picture beneath is revealed on this wooden play board and educational toy! Build fine motor skills while learning colors, numbers, animals, and more! The Wooden Latches Board has been created by award-winning toymaker Melissa & Doug, whose solid-wood toys make classical, treasured gifts. They have been specifically designed to not only provide children with an exceptional screen-free play option, but also to help them learn and develop critical life skills. 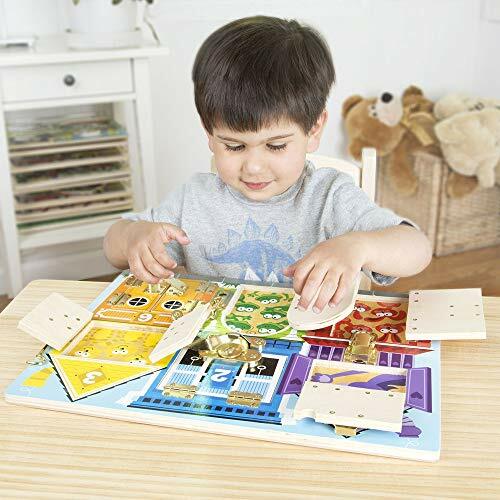 The Melissa & Doug Wooden Latches Board is a delightful activity for your inquisitive youngster. This play board challenges them to figure out how the 6 different latches work. Our developmental toys are designed to help younger children build fine and gross motor skills, while also discovering vibrant colors, numbers, animals, and more. This children’s developmental toy is made from smooth-sanded solid-wood and features beautiful artwork and exciting surprises behind the opening doors and windows. 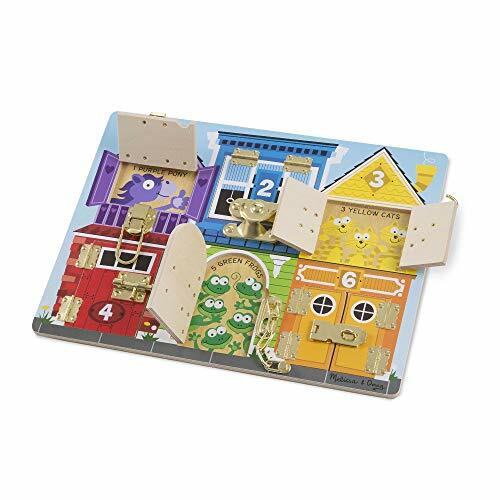 The Wooden Latches Board makes a great gift for children ages 3 and up. Add the See & Spell Learning Toy to round out the hands-on, screen-free play and learning.